Studying abroad could be more fun if you test the water before doing anything. Read more and find out how could testing water help you in abroad. Sentence-: a successful entrepreneur is one who knows how to test the water. Meaning-: judge people’s feeling or opinions before taking further action. Sentence-: no thanks to your remarks, I am still going to fight. Sentence-: thanks to your buddy ride ana, I could finally make it to the top. Sentence-: the petrol price these days is a bit thick. Sentence-: he got a thick ear by the teacher on getting late for three consecutive days. Sentence-:Don’t stop without knowing what it is, at least give it a whirl. Sentence-: Make sure you behave well or else you will have to reap the whirlwind. Sentence-: My grand father has whiskers. Sentence-:He is a boozer, all he knows is the whistle in the dark. Meaning-: pretend to be confident and not afraid. Sentence-: Why are you whistling in the wind, don’t you know she won’t change her decision! is one of those adventures you can take while studying in USA. The employment must be directly related to student’s major. A F-1 status of visa must be maintained by the student lawfully. Students who have engaged themselves into 12 months or more full-time curricular practical training are not eligible for OPT. You are permitted for a 12 month OPT in all. It means if you have done a 6 months of part time OPT you can do only 6 months of full time OPT. NOTE-: A student can do 12 month of OPT after receiving the undergraduate degree and then go to college and do 12 months of OPT on completion of graduation. Pre-completion and Post-completion OPT have different rules. Figure out if you fit in the eligibility criteria of OPT and always bear in mind, money should never be the reason to stop you from living your dreams. Trust your dreams and work hard to make them reality. There is an old adage that you always learn more on the job than you ever do by simply reading books. This is true because in a job you get to handle the real work, you implement what you have grasped from the books. you learn how to deal with work pressure. 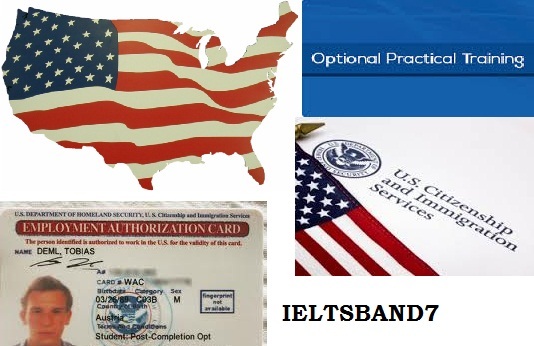 Owing to this the US offers students with optional practical training(OPT). OPT is the period during which undergraduate and graduate students with F1-status are allowed to work for at most one year on student visa towards getting practical training to complement their field of study. The permission is granted by the USCIS (United states custom and immigration services). A student who is has either completed their degree or has completed nine months in the college can apply to the OPT. OPT is granted for 12 and 17 months. To be eligible for the 12 month OPT students can be of any degree in any field but for 17 month you need to have received a STEM degree in one of the approved major listed on USCIS website. 1.When haven’t completed your degree-: In this case, you work as part time. 2.When you have completed your degree-: in this case you work full time i.e 20 hours a week. All you need to do is take the first step, all you need to have is the will, the way will get created on its own. The on- campus employment is the most freely permitted by the USCIS regulations. Although f-1 status students can avail a job on –campus, they are very limited. In either case you can always seek guidance from the International Student Office regarding the job. There are many schools who do require that you obtain permission from the International Student Office prior to accepting any on-campus employment. Some universities don’t permit an on-campus placement during the first year or first semester. The student must maintain a valid F-1 visa status. You can work up to 20 hours a week while school is in session. The employment may not take away a job from the US resident. School guidance is provided to ensure that you file all appropriate forms with USCIS and receive any necessary approval. Remember, all you need to take is the leap of faith, and trust that either you will land on ground or you will learn how to fly.